I vividly remember a conversation with Richard Vandersteen at the turn of the century, when he predicted that the only audio companies that would flourish in the 21st century would be those that made products offering greater performance than the customer expected for their prices. Historically, the Vandersteen brand typified that paradigm, with the Model 2, in all its various guises, remaining a best-selling speaker since its launch in 1977. (Between 1977 and 1993, 80,000 pairs were sold.) 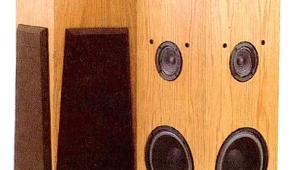 I was surprised, therefore, by the appearance of Vandersteen's Model Seven, which sold for $45,000/pair when it was favorably reviewed for Stereophile by Michael Fremer, in April 2010. By the time the Seven had produced one of my "Best Sounds" at the 2014 Consumer Electronics Show, its price had risen to $52,000/pair. I wrote in my report from that CES that, with an LP of Diana Krall singing Joni Mitchell's "A Case of You," "the hairs on the back of my neck stood up, so powerfully physical was the presence of the singer in the room. The Naim/Focal, Marten/Pass Labs, and Sony/Pass Labs exhibits got close to the Vandersteens in absolute sound quality, and all were even better in some respects. But none were quite so musically perfect across the board!" 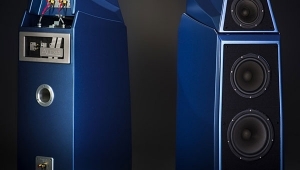 Driving the Model Sevens at the 2014 CES were Vandersteen's then-new M7-HPA monoblocks, which provide a high-passfiltered output (above 100Hz) to the upper-frequency drive-units of the Model Seven. At the time, I made a note to myself that I would like one day to try these amplifiers with the Sevens in my own room. That opportunity came later rather than sooner, after Vandersteen had updated the Model Seven to Mk.II status. 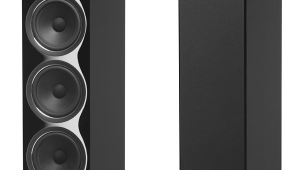 The basic architecture of the Model Seven hasn't changed since Michael Fremer's review: a rigid, carbon-fiber "cabinet within a cabinet" construction with a minimally diffracting stepped baffle; a tightly packed, vertical array of driversa 7" ScanSpeak Illuminator mid/woofer, a 4.5" open-basket upper-midrange unit, a 1" ScanSpeak Illuminator dual-chamber tweeter, and, firing to the rear, a fully adjustable, ¾" aluminum-alloy dome tweeter; first-order, 6dB/octave, impedance-compensated crossover networks; and a push/pull, dual-aluminum-cone, slot-loaded subwoofer powered by a 400W amplifier with an 11-band low-frequency equalizer with user-adjustable low-frequency contour. 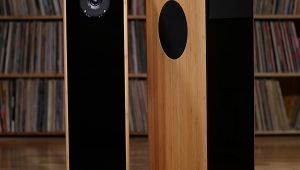 The front tweeter, midrange unit, and upper woofer all use Vandersteen's patented, proprietary Perfect Piston diaphragms, which sandwich a thin balsawood core between outer and inner skins of carbon fiber, to give an optimal combination of stiffness and internal damping (footnote 1). 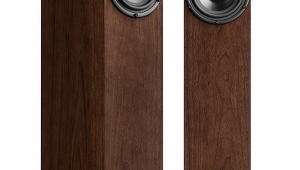 For the Mk.II version of the Seven, Richard and Nathan Vandersteen made a major change to the tweeter's acoustic environment, bringing its acoustic center into better alignment with that of the midrange unit, which in turn has meant less hand-adjustment of the crossover, to give a more easily achieved consistency in manufacturing. 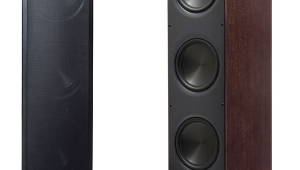 Other changes to the subwoofer driver, such as weaving the voice-coil leads directly into the spiders of the dual 12" cones, are claimed to permit significantly greater linear excursion below 100Hz. The new version of the Model Seven visually matches the . . . This elegant but hefty monoblockit weighs 120 lbsis made in the US and is built on a chassis machined from a solid aluminum billet sitting on three cone feet. The active circuitry is carried on a suspended truss with damped elastomer elements sourced from Harmonic Resolution Systems (HRS). The M7-HPA was the result of a partnership between Richard Vandersteen, who was responsible for the overall design and architecture, and engineer Dean Klinefelter, who designed the unusual, zero-loop-feedback circuit. The balanced input stage features two tubes, a 6N1P-EV and a 6H30, and feeds two single-ended output stages using NPN bipolar transistors. The loudspeaker is connected between the outputs of the two amplifier stages, neither of which has the usual emitter resistor. Vandersteen says that there are just five parts in the short signal path. Output power is specified as 600W into 4 ohms, and, in another unusual feature, the output transistors are not mounted on the finned heatsinks that comprise the amplifier's side panels. Instead, a liquid cooling system connects the heatsinks to the metal blocks on which the transistors are mounted, which keeps the devices at their optimal temperature. The pump that operates the cooling system is very quiet, as it needs to be. There are 10 separate power suppliesthe M7-HPA is stuffed with electrolytic and film capacitors, as well as a hefty toroidal transformerand the amplifier includes extensive protection circuitry that operates in conjunction with a rear-panel circuit breaker that turns the amplifier off, and dumps the energy stored in the supply to ground. A multicolor LED on the left of the front panel indicates operating conditions: steady green when the M7-HPA is in standby, flashing blue when it's turned on and as the operating conditions stabilize, then steady blue a few minutes later, when all is ready for music. 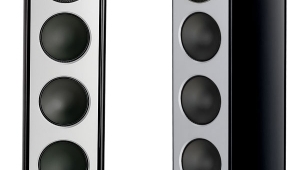 Three other LEDs on either side of the central stainless-steel on/off button indicate fault conditions: orange for overcurrent, yellow for overheating, and red for pump or component failure. HPA stands for High-Pass Amplifierthe M7-HPA rolls off the low frequencies below 100Hz with a first-order (6dB/octave) high-pass filter. This is not an amplifier for all systems, but instead is intended to be used to drive the passive upper-frequency driver arrays of any of Vandersteen's powered-bass speakersincluding the Quatro Wood CT, Model 5A Carbon, and Model Seven Mk.IIand other brands of speaker when used with dedicated Vandersteen powered subwoofers. 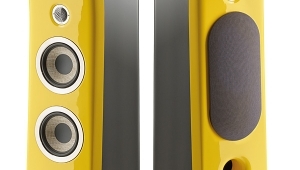 In an unusual arrangement that Richard Vandersteen first introduced in 1988, these speakers' subwoofer amplifiers reconstruct the <100Hz signal from the high-pass filtered input signal. The M7-HPA's price includes two pairs of proprietary DBS solid-silver speaker cables made by AudioQuest, and just long enough to allow each amplifier to sit next to the speaker it drives. The M7-HPA includes advanced power conditioning, and AC power is provided by a long cord fitted with a 20A IEC plug. I was impressed by every aspect of the M7-HPA. It seems to be as thoroughly worked-out an amplifier as I have encountered. For example, when you set it up, you must remove four internal bolts to free the amplifier suspensionin a nice touch, these bolts and the plastic transport blocks can then be screwed into the rear of the front panel, so they won't be mislaid. Although there is a handle at the back, there doesn't appear to be one at frontuntil you realize that the top of the inset in the front panel, on which is inscribed "Vandersteen M7-HPA," is actually a handle that allows the heavy amplifier to be easily moved. Again: Elegant. Richard Vandersteen visited to set up the Model Seven Mk.IIs in my listening room. We did some preliminary auditioning and maneuvered the speakers into the optimal positions. Richard then set up a sound-pressure-level meter on a stand at the height of my head in my listening chair, and used an ultrasonic tape measure to ensure that the speakers were the same distance from the SPL meter. We played his "Vandertones," which can be downloaded from Vandersteen's website: 11 narrowband warble tones, one set each for the left and right channels, with center frequencies ranging from 20 to 120Hz, corresponding to the Seven Mk.II's 11-band equalizer frequencies. Vandersteen adjusted the setting of each equalizer band until it gave an SPL meter reading that matched his target response. The adjustments mainly varied within ±1.5dB; a few at the lowest frequencies reached +5dB. We listened to a variety of music, making more fine adjustments, until Richard Vandersteen declared himself satisfied and left to catch his flight home. One of the M7-HPA amplifiers had turned itself off during setup, but seemed to be okay once it was turned back on. However, less than a week later, it turned itself off again and then wouldn't turn on. I shipped the amplifier to Dean Klinefelter, who found that one of the three Vishay plate-load resistors on the 6N1P input tube had broken. The repaired amp worked fine upon its return, but six weeks later, the other M7-HPA failed in precisely the same way. Again, the problem was a plate-load resistor in the input stage; again, once the amplifier had been repaired, all was well. 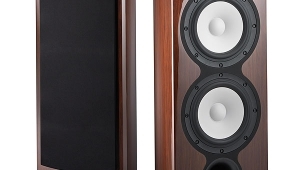 Footnote 1: All the Perfect-Piston cones are handmade in Hanford, CA at Vandersteen Audio, along with the open, "aerodynamic" baskets of the 4.5" midrange unit. (This basket carried a patent for over 20 years, which only recently expired.) 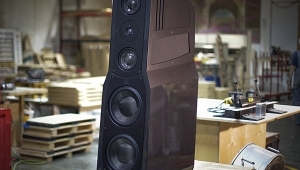 The midrange baskets and Perfect-Piston cones are shipped to Scanspeak, who does the assembly on the midrange drivers with tooling owned by Vandersteen Audio. 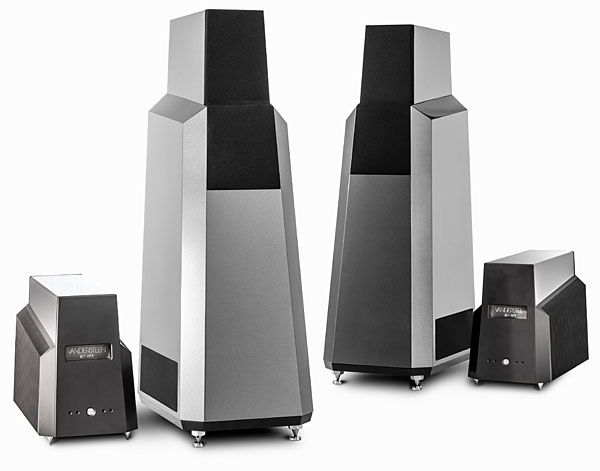 The non-carbon versions of the driver get a woven-fiber cone that's used in every floorstanding Vandersteen speaker below the 5A Carbon. John, sounds like this is a highly recommended speaker? 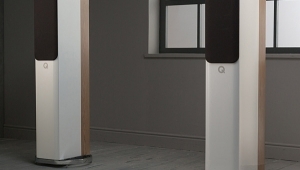 What a great review of an amazing powered speaker system with what sounds like some first ever experiences, especially with some of your own recordings. I must admit though that after reading the conclusion I wondered why you withheld any recommendation for this system. I read your first paragraph and you spoke about getting more that you expected. After rereading your review, I get that same feeling you had with the original 2's. Can you highly recommend this system? Thanks I value your response. After rereading your review, I get that same feeling you had with the original 2's. Can you highly recommend this system? Yes Indeed. It broke my heart when the shipping company picked it up last week to be returned to Vandersteen. And a full-range version of the Vandersteen M7-HPA monoblock would be a wondrous amplifier indeed! But there is a certain relief in being back in the land of audio components that I can actually afford! John, thanks so much for responding and sharing your thoughts. 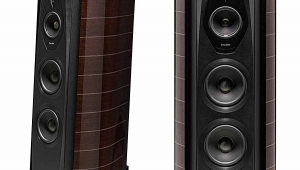 The best thing about Vandersteen is that they DO have affordable for nearly anyone as they have a trickle down, signature sound. I converted to them a few years ago as a lower cost of admission and am very happy with them. Good to see a designer sticking with his inordinate design criteria, and taking it to it's logical extremes. I believe he has developed what may be the best cone construction in the industry with his carbon/balsa drivers. While his speakers aren't quite my cup of tea, I certainly respect him as one of the most diligent and talented designers in the industry. I recently purchased the Vandersteen Model Seven Mk II Speakers and Vandersteen M7-HPA Mono Amps from John Rutan at Audio Connection. John positioned the speakers in my family room using laser sighting and tuned the speakers' powered subwoofers with their 11-band equalization to give an even response in my room across their frequency range. The ability to tune the bass on these speakers has made them integrate into my room better than any of the other speakers I have previously owned. 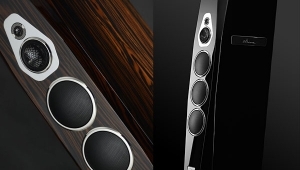 Consequently, the bass creates the perfect cohesive foundation for the midrange and treble in my listening room. John was also nice enough to loan me an Audio Research Reference CD-9 Digital Player, Audio Research Reference 6 Preamp and AudioQuest Fire Interconnects. The synergy of the Vandersteen speakers and mono amps, combined with the Audio Research preamp and digital player, has resulted in the highest sound quality I have ever heard and it is occurring right in my non-dedicated listening room! The Vandersteen/ARC/AQ system is producing amazing tonality. Midrange body, weight and bloom. Tremendous ease without a hint of solid state or digital edge. Vocals and instruments are holographic and float in space with wonderful separation between vocal and instrumental lines. The soundstage, depending on the recording, can be very wide and deep, extending well beyond the walls of my room. Bass is very robust and lifelike with wonderful texture and goes down to subterranean levels. Deep pipe organ notes are felt to the core. It feels like I'm in a cathedral. Female jazz vocals are as smooth as silk with zero sibilance. Trumpets really have that blatt sound. Violins sound like wooden boxes, not glass ones. Dynamics are lightning fast and powerful. The pure silver AudioQuest cabling enhances detail and nuance with no additional treble or midrange brightness. To sum it up, for the first time ever, I am totally content with the world class sound quality I am enjoying. The system sounds so lifelike, I forget about the components and become totally immersed in the music. I often listen very late into the night, mining my music collection to rediscover old favorites. Mr. Vandersteen, you hit it out of the ballpark with this speaker/amp combo! There's a bit of resonant activity around 4 or 5 Khz and also 18 Khz in the CSD plot. Other stuff looks pretty good; but then for $62K it should be.